A Japanese translation entitled Senryô-ka Nihon no hyôki kaikaku was been published in 2001 by Sangensha (Tokyo). 2013 Zipf and Morphemes: a Response to Sproat. Written Language & Literacy, vol. 16 no. 1 pp. 112–14. 2012 Describing Old Japanese Kanji Usage: the Inadequacy of Traditional Terminology. Scripta 4: 93–105. 2005 Review of Multilingualism in China: the Politics of Writing Reforms for Minority Languages 1949–2002, by Minglang Zhou. Language vol. 81 no.3 pp. 761–65. 2005 “Japan: Writing System.” Encyclopedia of Language and Linguistics, 2nd ed., ed. Keith Brown, vol. 6 pp. 95–102. Amsterdam: Elsevier. 2004 Ideogram: Chinese Characters and the Myth of Disembodied Meaning. Honolulu: University of Hawai’i Press. 2002 “How the Ideographic Myth Misleads Historians: An Example from the Occupation of Japan.” Difficult Characters: Interdisciplinary Studies of Chinese and Japanese Writing, ed. Mary Erbaugh, pp. 194–204. Columbus, O.: Foreign Language Publications. 2001 “Functional Digraphia in Japan as Revealed in Consumer Product Preferences.” International Journal of the Sociology of Language no. 150 pp. 141–52. 2001 Review of The Japanese Mental Lexicon: Psycholinguistic Studies of Kana and Kanji Processing, by Joseph F. Kess and Tadao Miyamoto. Word vol. 52 no. 3 pp. 479–83. 2001 Review of Word-processing Technology in Japan: Kanji and the Keyboard, by Nanette Gottlieb. The Times Higher Education Supplement (London), 12 October. 2001 “Functional Digraphia in Japan as Revealed in Consumer Product Preferences.” International Journal of the Sociology of Language no. 150 pp. 141-52. 1997 Review of The World’s Writing Systems, edited by Peter McDaniel and William Bright. With John DeFrancis. Language in Society vol. 26 no. 3 pp. 436-39. 1996 “Taking Digraphia Seriously: Future Software for East Asia.” Journal of the Chinese Language Teachers Association, vol. 31 no. 3 pp. 45-55. 1995 “Logographic and Semasiographic Writing Systems: A Critique of Sampson’s Classification.” With John DeFrancis. Scripts and Literacy: Reading and Learning to Read Alphabets, ed. David. R. Olson and Insup Taylor, pp. 45-58. Dordrecht: Kluwer. 1994 Review of The World on Paper, by David R. Olson. The Times Higher Education Supplement (London), 2 December. 1994 Rejoinder to Geoffrey Sampson, “Chinese Script and the Diversity of Writing Systems,” with John DeFrancis. Linguistics, vol. 32 no. 3 pp. 549-54. 1994 Review of Understanding Japanese Information Processing, by Ken Lunde. Journal of the Association of Teachers of Japanese, vol. 28 no. 1 pp. 103-10. 1993 Rejoinder to Chad Hansen, “Chinese Ideographs and Western Ideas.” Journal of Asian Studies, vol. 52 no. 4 pp. 949-54. 1992 “Literacy East and West: Data from Linguistics and Psycholinguistics.” Language, Writing Systems, and Literacy, ed. Umesao Tadao, J. Marshall Unger, and Osamu Sakiyama. Senri Ethnological Studies, no. 34 pp. 93-107. Senri: National Museum of Ethnology. 1991 “Memorizing Kanji: Lessons from a Pro.” Schriftfestschrift: Essays on Writing and Language in Honor of John DeFrancis on His Eightieth Birthday, Sino-Platonic Papers, no. 27 pp. 49-58. Philadelphia: Victor H. Mair. 1991 “Minimum Specifications for Japanese and Chinese Alphanumeric Workstations.” Characters and Computers, ed. Victor H. Mair and Yongquan Liu, pp. 131-40. Amsterdam: IOS Press. 1991 Review of Language the Modern State, by Nanette Twine. Monumenta Nipponica, vol. 46 no. 4 pp. 548-50. 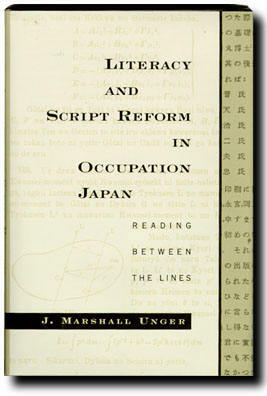 1991 Review of A History of Writing in Japan, by Christopher Seeley. Monumenta Nipponica,vol. 46 no. 3 pp. 381-84. 1990 “The Very Idea: The Notion of Ideogram in China and Japan.” Monumenta Nipponica,vol. 45 no. 4 pp. 392-411. 1989 “Language Engineering versus Machine Engineering: A Linguist’s View of the Character Input Problem.” Text Processing Chinese by Computer: Characters, Speech and Language, ed. Wesley A. Clark, pp. 113-23. Washington, DC: National Academy of Sciences. 1986 “Japanese Research and Policy on Health Hazards of Video Display Terminals.” Office of Naval Research Far East Scientific Bulletin, vol. 11 no. 1 pp. 4-12. 1986 “Nihonjin no yomikaki nôryoku to konpyûta [Japanese Literacy and Computers].” Kyôto Sangyô Daigaku Kokusai Gengo Kagaku Kenkyûjo Shohô, vol. 7 no. 2 pp. 167-75. English translation in Sino-Platonic Papers, no. 6 (1988). 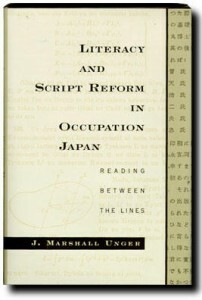 1984 “Japanese Orthography in the Computer Age.” Visible Language, vol. 18 no. 3 pp. 238-53. 1984 “Japanese Braille.” Visible Language, vol. 18 no. 3 pp. 254-66. 1983 “A Mnemonic Code for Sino-Japanese Characters (Kanji) Based Entirely on their Readings.” Computer Processing of Chinese and Oriental Languages, vol. 1 no. 2 pp. 135-44. 1983 “Chinese Input in Computer-Based Education (Abstract).” Proceedings of the International Conference on Chinese Information Processing [Beijing], vol. 1 pp. 332. 1983 “The Problem of Japanese Input.” Journal of the Association of Teachers of Japanese, vol. 18 no. 1 pp. 56-64. 1983 “Real-time Han’gul Input on the PLATO Computer-Based Education System.” Korean Linguistics, vol. 3 pp. 145-58. 1983 “A Compressed Representation of Line-Drawn Chinese Characters.” Proceedings of the International Conference on Text Processing with a Large Character Set [Tokyo], pp. 352-53. 1979 “Kanamajiribun Editing and the PLATO Computer-Based Education System.” Journal of the Association of Teachers of Japanese, vol. 14 no. 2 pp. 141-56.